When British technology firm ind.ie announced it was quitting the UK because of the government’s plans to widen mass internet surveillance through a Snooper’s charter, and to block messaging services unless they have a government backdoor, I predicted that they weren’t going to the be the last. Eris Industries has announced it has told its staff to leave the country and, at least temporarily, moved its headquarters to New York. May 31, 2015 Posted by Dissent Non-U.S.
On May 25, 2015, the French Data Protection Authority (“CNIL”) released its long-awaited annual inspection program for 2015. Under French data protection law, the CNIL may conduct four types of inspections: (1) on-site inspections (i.e., the CNIL may visit a company’s facilities and access anything that stores personal data); (2) document reviews (i.e., the CNIL may require an entity to send documents or files upon written request); (3) hearings (i.e., the CNIL may summon representatives of organizations to appear for questioning and provide other necessary information); and (4) since March 2014, online inspections. A survey given to students in our region has some parent’s calling our newsroom, asking if the survey questions are a bit too personal. 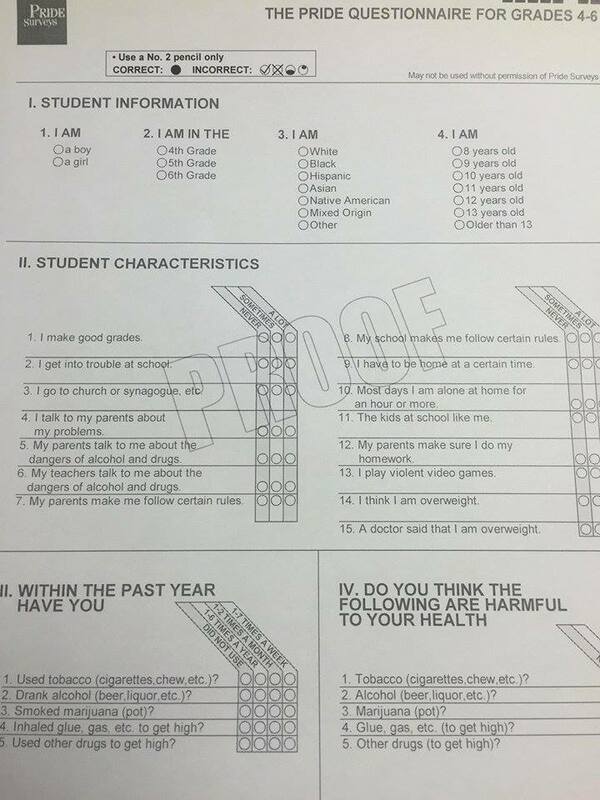 “I go to church or synagogue… Most days I’m alone at home for an hour or more… A doctor said that I’m overweight.” These are just a few question on that Jackson County, West Virginia school survey given to 5th thru 12th graders. It’s called a Pride Survey. It’s an anonymous, national survey funded by a grant through the Jackson County Anti-drug Coalition. The grant is for $125,000 per year for 5 years, officials said. The Protection of Pupil Rights Amendment (PPRA) was designed to give parents the right to consent (or not consent) to surveys that get into personal details. The problem is that PPRA doesn’t apply to a situation where the survey isn’t funded by the U.S. Dept. of Education. In this case, if you watch the video on the news site and look at the survey, you’ll learn that the students’ names are not collected on the form and that a permission form was allegedly sent home that gave parents the opportunity to opt their child out of the survey. But as one parent who was interviewed said, he never saw any form. Consent for surveys about sensitive information should be opt-in and not opt-out. Schools and agencies count on parents not bothering to opt their children out or never seeing or understanding the forms. PPRA needs to be amended to expand the protection of parental written opt-in consent to all surveys involving sensitive information, not just those funded by the federal department of education. Michael Rhodes, the charismatic chair of Cooley’s privacy and data protection practice, took the stage at an awards dinner in late April with an extra bounce in his step—and a blunt prediction for his colleagues in the plaintiffs privacy bar. “I suspect a lot of people, perhaps on the plaintiffs side, will be out of work within the year,” he said. Rhodes was referring mainly to the Supreme Court’s decision earlier that same day to grant review in Spokeo v. Robins, a case that has the potential to radically reshape privacy litigation. But his remarks also reflected growing confidence among defense lawyers that they have a grip on the legal threat posed by suits that seek to hold companies accountable for improperly collecting, selling off, rifling through or failing to protect customers’ data. Read more on The Recorder.